Time to escape and celebrate a night on the town with your special someone? 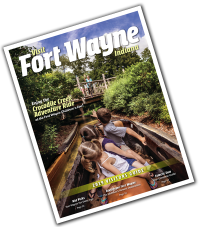 Look no further than Fort Wayne Indiana! The 2014-2015 Broadway at the Embassy season includes such performances as Jersey Boys, Mama Mia, Blue Man Group and more! For a taste of local talent, try the acclaimed Fort Wayne Civic Theatre. A long list of national television and Broadway performers have caught the acting bug right here on the stage of the Civic Theatre and you won&apos;t want to miss some of the treats they have in store this season. The Fort Wayne Philharmonic, now performing its 64th season, has won five awards for "adventuresome programming" from ASCAP. Come see why Fort Wayne locals and visitors alike love the Philharmonic.